Cosmos and Damian Polished | Ich bin ein Sender. Ich strahle aus! | I am a sender. I transmit! This uncut proof sheet for a postcard shows four identical views of Manhattan’s World Trade Center Towers. 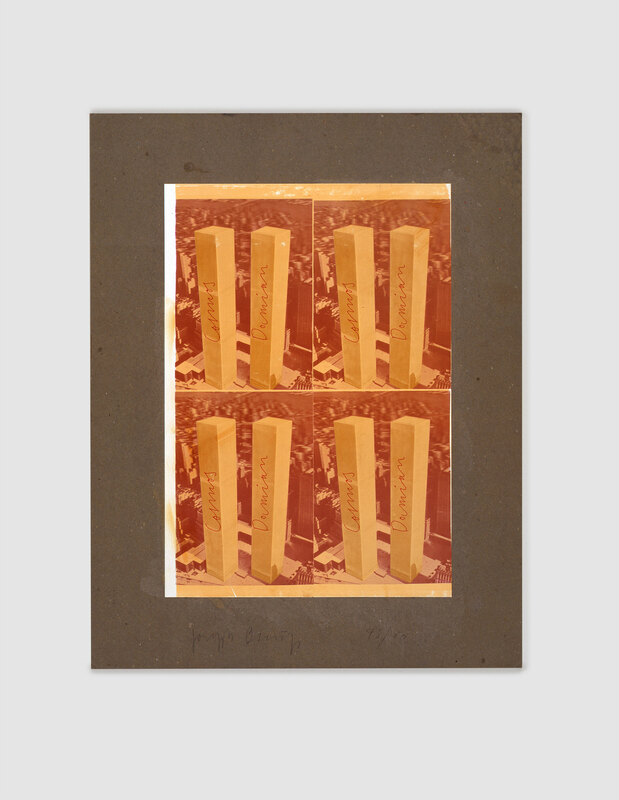 The slight blurring effect within the image stems from the source from which it was copied, a 3-D postcard Beuys had purchased in New York in 1974, during his first visit to the United States.1 In reissuing the postcard as a multiple, Beuys made two changes to its appearance. The first was to coat it in a layer of translucent, yellow-tinted shoe polish, and the second was to write the words ‘Cosmos’ and ‘Damian’ along the front façades of the towers. Together, these interventions transformed the towers from symbols of American capitalism into emblems of a new social order, which Beuys hoped to foster with his art. As Johannes Stüttgen has recounted, Beuys’s recolouring of the towers was intended to transmute them into two giant sticks of butter.2 Beuys often used butter in his art as a bearer of spiritual warmth, a form of energy he viewed as the source of all change and creativity. By transfiguring the drab grey towers into glowing pillars of warm energy, he was thus refashioning them as immense beacons of creativity. The words ‘Cosmos’ and ‘Damian’ help clarify the kind of creative activity that Beuys hoped to stimulate with this work. Together, they refer to two early Christian saints, Cosmas and Damian who were active in the 3rd century C.E. and worked as travelling physicians. 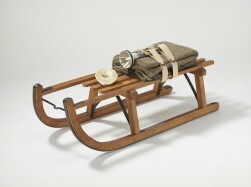 The healing mission of the saints appealed to Beuys, who throughout his career conceived art as a source of therapeutic experience.3 Beginning in the early 1970s, he used his own art to call for the inception of a more egalitarian society, which would redress the shortcomings of existing political systems. 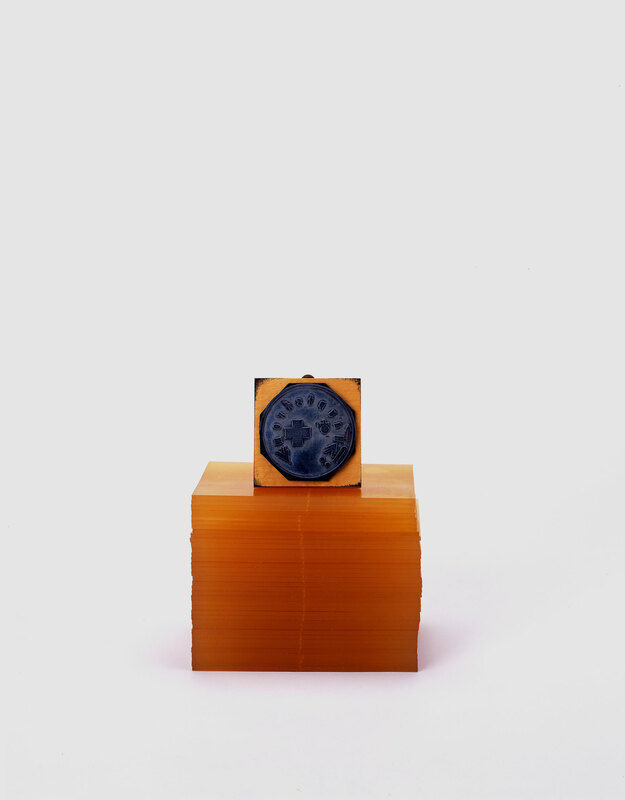 Cosmos and Damian Polished formed part of this initiative and by inscribing the names of the saints on the sides of the Trade Center towers, Beuys aligned his social project with their healing mission. 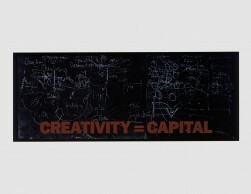 While conceived first and foremost as a call for social change in the United States, the work in fact makes a broader appeal, conveyed via Beuys’s decision to write the name Cosmas as ‘Cosmos.’ By means of this alteration, he alluded to the fact that his social aspirations were not confined to a single context, but were instead universal.